Being human is only an illusion. In the shadows outside Sugar and Spice café, my life changes forever. From the darkness, a mysterious stranger emerges. Coincidence? Not for him. Devyn St. Cyr reveals a startling truth about me—I’m a Kitsune. A what? My thought exactly. Turns out I’m a shape shifting fox with the ability to have extraordinary powers. Powers that make me a hot target for every ambitious otherworldly creature. Thrust into the middle of a royal battle for a crown I wasn’t sure I wanted, I must do what no other Kitsune in a century has accomplished. Acquire nine tails and the power that comes with them. Or the fate of two worlds will crumble. No biggie. 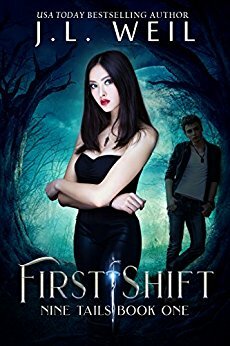 Fans of Twilight, A Shade of Vampire, and Fallen will fall in love with First Shift, a short novel series. This is a very interesting book , it isn't your usual shifter book . We are talking Japanese anime here . I was really blown away with this book . Karina's life changes one night behind the coffee shop she works at . When two things come after her and want her soul . Enter Devyn St Cyr .wielding swords with snakes attached as he sends the two back to the other world . Well that is when Karina's life changes she shifts and finds out that she is a kitsune and with the help of Devyn who is sworn to protect her . She is thrown into a battle that she doesn't know if she actually wants and a crown she doesn't want to wear . Will she be able to collect the 9 tails and save both worlds from crumbling down around her. When I started reading this book , I will admit I thought it was a normal every day shifter book . I had to look up what a kitsune is . But when I got into the book I couldn't put it down . There were just a couple of spots where the author could of done a little bit better editing . A couple of missed words and words that didn't sound right . There is also a big cliff hanger at the end . I did really enjoy this book and loved the characters and the back stories . I can't wait till I dive into book two and see where Devyn and Karina end up going . If you want a different type of shifter and some Japanese legend check it out . You won't be disappointed .